Birthdays, anniversaries, Valentines Day: a custom video is a great way to express love, say thank you, and share memories on a special occasion. A slideshow of photos reminds others of the experiences you’ve had together and gives them a nostalgic digital artifact of your relationship. You can also make slideshows with music to commemorate events, illustrate the passage of time, or visualize a topic/theme. 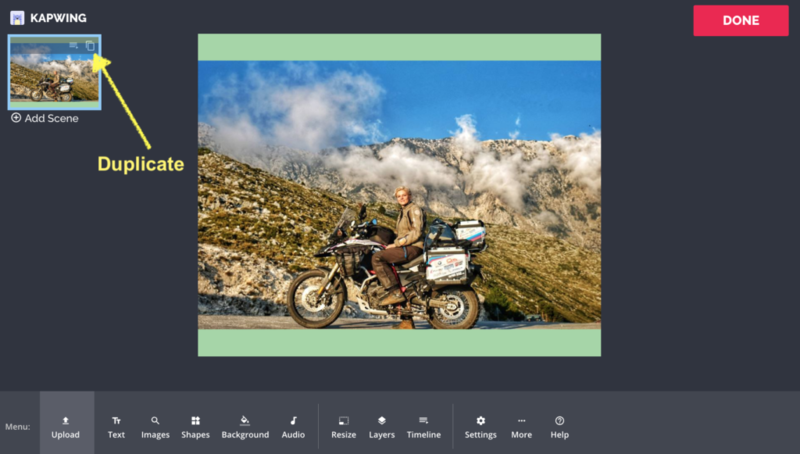 By bringing together different images, montages can be informative and are a great tool for teachers to reinforce lessons, brands to reach new audiences, or companies to onboard new employees. In this article, I’ll describe how you can take a series of pictures and combine them together into a video with music. Note: The tool I use in this tutorial, Kapwing, is only available right now on computers and tablets. It works on Macs, Windows, and Chromebooks as well as larger iPads and Android tablets. On smaller screens, you need to first use the Montage Maker to make a slideshow then the Add Music tool to combine it with sound. To make a video with photos, you first need to find a video editing program. I recommend Kapwing because it’s free, online, fast, and simple to learn and use. 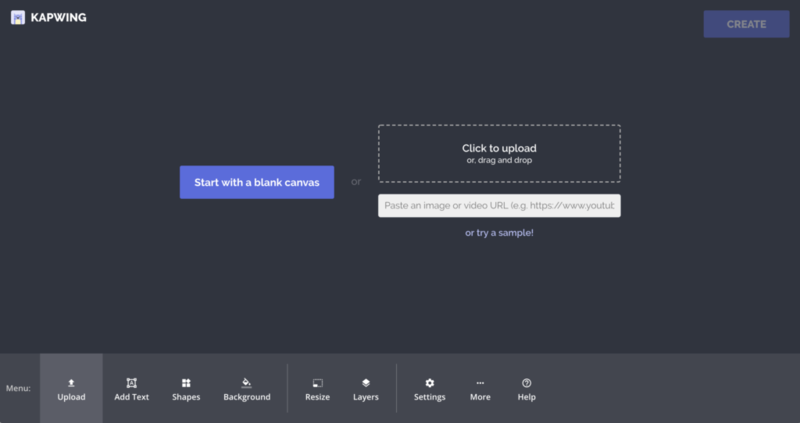 Start by opening the Kapwing Studio and clicking “Get Started.” Then, open a blank canvas. By default, you will get a square, 1:1 canvas, but you can resize your canvas to be the whatever aspect ratio you want your output video to be. Choose 9:16 for your Story, 16:9 for YouTube, or set a custom size. In my example, I used 5:4 for a landscape Facebook video. You can also change the color of the background to match your brand or the vibe of the video. Creators can choose one of the preset color swatches or enter their own hex code. Next, upload the first picture. You can either drag and drop a file or click the “Upload” button to find the picture on your phone or computer. 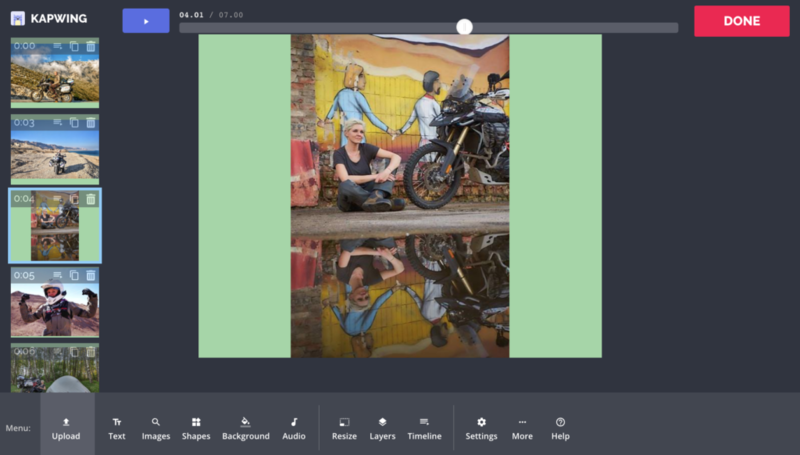 Use the sliders to position and size the picture on the digital canvas. You can also add text, labels, or stickers to the scene. On the left side of the editor, you can see a thumbnail of your current scene. Click the “Duplicate” icon to make a copy of your current scene. The Studio canvas will transform into a video where each picture appears for three seconds. You can use the purple play button to view the preview of your video. Click on the second scene and replace the photo with a new picture. Continue adding scenes until your video has all the pictures you want. You can change the duration of each scene by clicking on the “Timeline” icon (left-most icon) and choose a new length. After you have finalized the visuals of your video, click the “Audio” tool in the main toolbar to add your music. The first step is to choose the music you want for your video. Browse through YouTube and other music libraries to find the song you want, then copy and paste the URL to that video or download the audio file. You can import a popular YouTube song, record a voiceover, or use a custom MP3 file. Back on Kapwing, upload your audio file or import from a pasted URL. The music will load, and you can adjust the start time of the soundtrack in your montage. You can also trim the audio down, if you only want it to appear for certain sections, and loop it if it’s too short. I decided to use the song “4Ever” by the Veronicas. If you’re going to publish your video on social media or use it commercially, make sure you have the rights to republish the song. Even if you qualify under fair use, make sure to attribute the original artist by adding a text watermark on one of your scenes. Watch your video all the way through to make sure it’s in the right order and that the photos match up well with the music. Once your video looks right, click the “DONE” button to process your finalized video. After a few moments, Kapwing will make your video available for viewing! You can share the URL to the final video page or download the video to share the MP4 file directly. My video with pictures and music! Kapwing is free to use, but there will be a small Kapwing watermark on your output video in the free version. You can subscribe to Kapwing Pro to get unlimited no-watermark access to Kapwing’s tools. That’s all! I hope this article helps you make montages from photos and music. 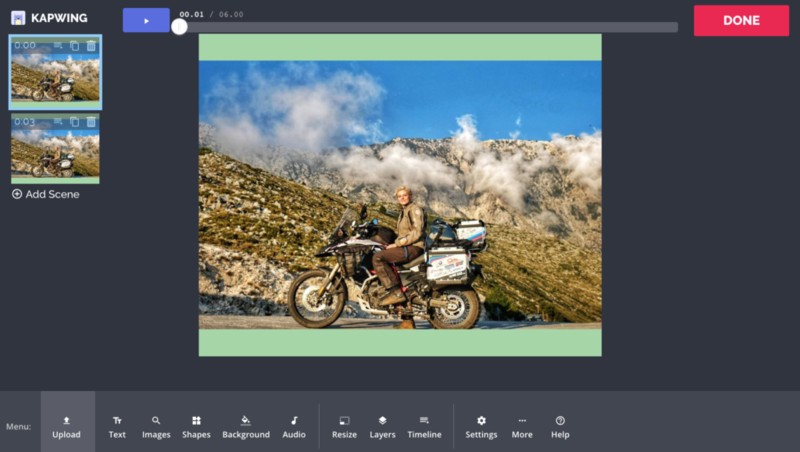 The Kapwing Studio supports GIF and MP4 scenes also, so you can make multimedia collages and layouts. Looking forward to seeing the creations that come it! It’s possible to make some ajustmants on volum of audio? I just edited a video that a man talks and when I added the music, the volum was too high and I cant listen the man. I tried many others softwares but I still can’t do it. It will be perfect if Kapwing has. Not yet, although we hope to add this feature in the future!